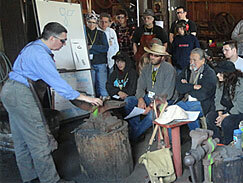 The California Blacksmith Association offers educational activities at events such as Spring Conference, Wayne's World, Oktoberfest, and special workshops offered whenever possible. In addition, CBA fulfills its primary function as a non-profit educational organization by sponsoring a number of ongoing blacksmithing workshops. Major events are listed on the events page. The CBA offers a number of low-cost workshops, know as Forge Workshops. These are low-cost workshops with the payment usually covering the cost of materials. Workshops are usually held in the shop or home shop of a member, but are sometimes held at museums or other public facilities. The instructors are all qualified smiths who are volunteering time to keep the craft of smithing alive. Some instructors have years of experience as working smiths. All instructors have met qualification standards set by the CBA education committee. They are also required to undertake additional training.